We carry a huge selection of sterling silver components such as findings, beads, bulk chains, finished chains/necklace, clasps, ear wires and lot more. 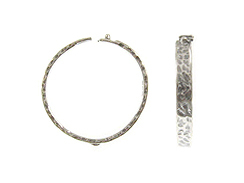 Sterling silver beads such as plain smooth beads, stardust beads, corrugated beads, mirror beads, beadcaps, and rice beads. In sterling silver components or findings we carry the crimp tubes, crimp covers, crimp ends, Twisted Tornado crimps (tm), twisted crimp tubes; open and closed jump rings (O rings), SNAPEEZ(tm), jump locks, split rings, triangular jump rings, oval jump rings; head pins and eye pins in a variety of gauges; ear wires such as french hooks, bead end, shepard hook, lever back ear wires, lever back ear wires with cubic zirconia (CZ), ear threaders; pendant and locket bails; connectors and links; lobster claw clasps, trigger clasps, push clasps, swivel clasps, toggle clasps, spring ring clasps, pearl clasps; extender chains, a variety of bulk chains such as cable, rolo, hammered, and other fancy chains; bulk wire in a variety of gauges from 12 gauge to 30 gauge, half hard, dead soft as well as .999 fine silver wire ideal for soldering; charm bracelets, cuff bracelets, adjustable bracelets, European style bracelets, large hole beads for European style bracelets. We also carry a large variety of sterling finished necklaces in ball bead chain, box chain, cable chain, rolo chain, omega chain, snake chain, diamond cut snake chain, popcorn chains and more. Most of these we carry in bright sterling silver finish but we also do carry some rhodium plated sterling silver chains for that extra elegant look. We do carry box chains, cable chains and diamond cut snake chains in vermeil also (gold plating over sterling silver). If you are looking for some chains that we don't carry please contact us and we can look into getting those for you.